Our near 60 degree temps today make those spring loving thoughts run free. Primulas are pink and yellow perfection. The tag said "grown in Canada". I wonder if it came all the way from here? What word comes to mind when I see this little wreath. What a bright and cheerful yellow wreath! No sun here. No sixty degree weather either. Cold and rainy. Enjoy that weather, Suzy! Oh, that wreath is way too cute!!! LOVE IT! MUST HAVE IT! Are you selling them? 60 Degrees…60 DEGREES!!! I have fantasies like that. 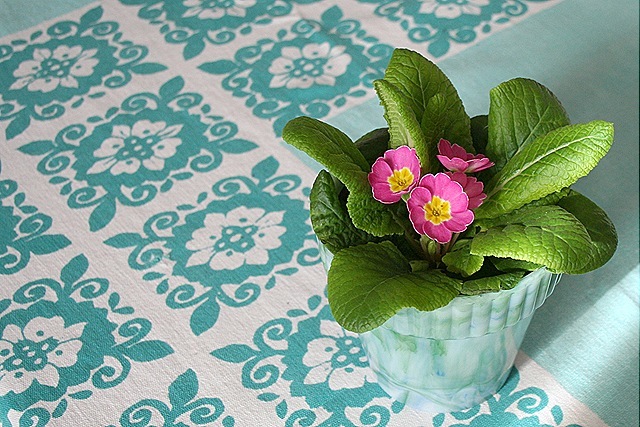 Thanks for sharing your primula with us frozen people. 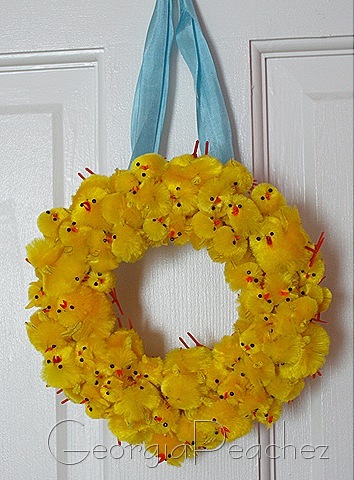 that chickie wreath is adorable! glad to hear you’ve warmed up a bit! We won’t see 60 degrees ’til April! Maybe. I LOVE that cute little wreath! Where on earth did you find that? This is so totally adorable and happy! !